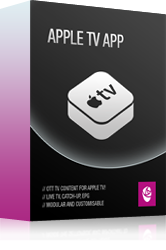 This Apple TV app accommodates watching live television and TV programs Over The Top (OTT). Besides watching TV, the app is equipped with a unique EPG and search functionality. On top of that the User Interface is completely in line with Apple TV GUI guidelines. It is intuitive, and childishly simple to use. The design of the EPG is unique, and differs from all the guides that are based on a grid view, with the programs arranged in blocks. The patented Stoneroos EPG shows the channels side to side, as has been proven to be a success in earlier EPG’s made by Stoneroos. While scrolling up and down within a channel, all other channels jump to the right time slot, providing a good overview of all programs that are broadcasted at the same time. Due to a lack of computing power in older set-top boxes this was not possible, but with the Apple TV4 box this is finally a reality, bringing the potential to dethrone the old fashioned grid view.